Reference: G. William Domhoff, Who Rules America Now? A View for the '80s, Englewood Cliffs, NJ, Prentice-Hall, 1983, pp. 85, 134. From the 1950s the Conference Board, the Council on Foreign Relations (CFR) and the Committee for Economic Development (CED) worked together and had overlapping and interconnecting membership. These groups also had a large overlap with the Business Council. founding chair of the Business Roundtable. Reference: G. William Domhoff, Who Rules America? Power and Politics, 4th edn, New York, McGraw Hill, 2002, p. 92. 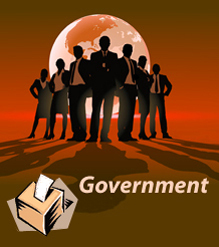 The Business Roundtable (BRT) has become central to these corporate policy groups although it was only a lobby group itself. Its directors are largely drawn from the inner circle of business leaders who are on the boards of more than one company and are also members of other business coalitions, particularly the Business Council but also CED, National Association of Manufactures (NAM), American Enterprise Institute (AEI), CFR, the Conference Board and several others (see figure below). 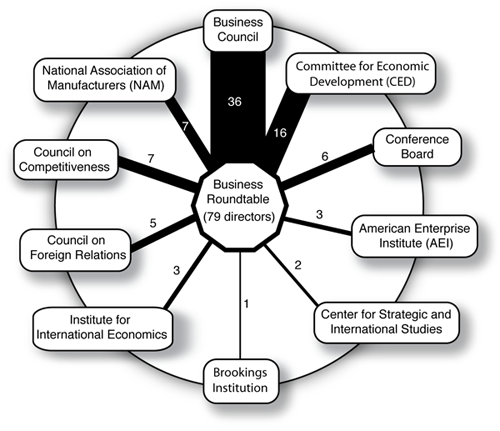 Note: Seventy nine of the Business Roundtable directors are also members of several other policy groups and think tanks as shown in this diagram. The spokes of the wheel show the number of shared directors between organizations. For example 36 BRT directors are also members of the Business Council. Source of Information: G. W. Domhoff. Who Rules America? Power and Politics, 4th edn. New York: McGraw Hill, 2002, p. 93.